Allmountain models win over more and more skiers each year. The allrounders are characterised by their diversity: as well as on groomed slopes, they promise a pleasurable ride off-piste and on powder, while at the same time saving the skier's energy. Hence, they are perfect for on- and off-piste fans as well as backcountry and powder enthusiasts. 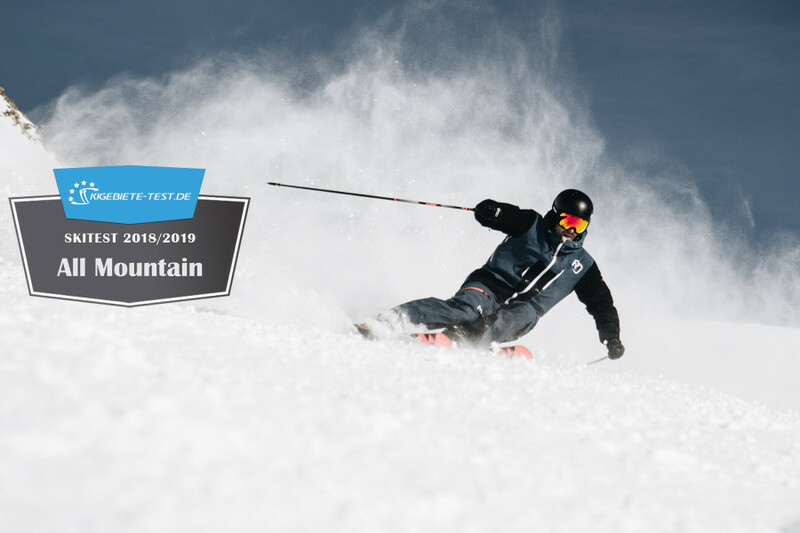 We went to St. Johann-Alpendorf to test the new models of the 2018/19 season and their technical traits. Since looks play an important role in a ski purchase decision as well, particularly nice designs also recieved awards in the category "SnowStyle". High temperatures provided perfect test conditions for this category, and made for a diverse skiing day. Four of the reviewed models convinced us with their "very good" performance, five recieved a "good" rating. The victory in the category "Allmountain" goes to Salomon XDR 80 Ti. It received excellent scores in all areas, and stands out through its low effort. The lightweight is also very steady on icy, hard slopes, and guarantees a pleasurable ski day in varying snow conditions. Our judges were delighted, and awarded it with a score of 39.7 and the rating "very good". >> All information on Salomon XDR 80 Ti can be found in our database! Only .7 points behind, Atomic Vantage X 83 CTI makes second. The widest ski of Atomic's Vantage-X series allows for incredibly smooth and effortless skiing. Its excellent steadiness provides stability and prevents the skis from fluttering at higher speeds. >> More information on the model! Third place is shared by Fischer Pro Mt 86 Ti and Blizzard Quattro RX. Both allrounders convinced the judges with their top performance at long radi. Fischer's MTN 86 stood out with its effortless, stable drivability on the slope. Its elegant, grey and black design also brought the lightweight the SnowStyle bronze metal. >> Find out more about the ski! Blizzard Quattro RX is a well-aligned, reliable allrounder. Its strength are long aggressive turns on-slope, but it scores at higher efforts as well. At an average of 37.9 points, it shares the third place of "Allmountain" with Fischer Pro Mt 86 Ti. >> Learn more about the ski in our database!